Samford University celebrated alumni achievements at the annual homecoming banquet Nov. 5 during 2015 homecoming weekend. In welcoming the more than 200 guests, the Samford Alumni Association noted that the evening was continuing a tradition that dated to the 1860s of alumni returning to campus for a formal banquet. The event, a candlelight dinner held for decades at spring commencement, was revived 12 years ago at homecoming. 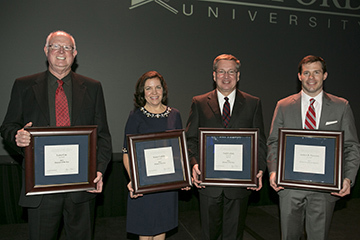 The highlight of the evening was recognition of the university’s three Alumni of the Year and the Outstanding Young Alumnus. Honorees were Karen Duncan Carlisle ’88, W. Todd Carlisle ’88 and J.D. ’91, Larry Cox ’72, and Andrew Patterson ’05. The Carlisles, who are from Birmingham, related a story of meeting at the first football game of their freshman year. Todd remembered the moment and the buttons the students received to wear at the game. He later gave his button to Karen for an anniversary, although she admitted not remembering that first meeting. Karen had a career as a physical therapist, and is now an active church and community volunteer, including several areas of service at Samford. Todd is a managing partner for the Birmingham law firm Sirote & Permutt. As an added homecoming celebration for the family, their daughter Mary Beth was part of the 2015 homecoming court. Cox attended Samford on a football scholarship before entering a successful career as a dentist in North Alabama. He played on Samford’s championship team in the early 1970s. Patterson, who is a partner and executive vice president for a Birmingham commercial real estate development company, was celebrating the 10th anniversary of his class. Lauren McCaghren, senior director of alumni programs and annual giving, recognized classes for their contributions during the previous year. The Class of 1981 was the top dollar producer with more than $180,000. The Class of 2013 had the largest number of donors with 60. The Class of 1942 had the highest percentage of members who contributed with 75 percent, and the Class of 2007 had the highest percentage of participation among young alumni with 10.6 percent. McCaghren also announced that the three major reunion classes — 1965, 1991 and 2005 — had collectively given more than $43,000 to date to special reunion funds. In his remarks, Samford President Andrew Westmoreland noted that the connection across the generations is what is important to Samford people. Homecoming continued on Saturday and Sunday with a full schedule of events.